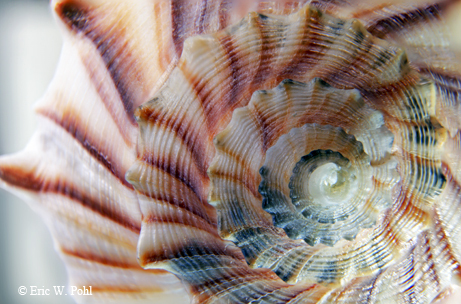 ﻿﻿﻿﻿﻿Lightning whelks are treasurered for their spiraling homes. ﻿﻿﻿﻿Tiny calcified fragments of colorful shells litter the beach, lining the shore as far as the eye can see. As I look in wonder at the sea of color beneath my feet, one particular shell catches my eye, and I pick it up. Amazingly, it’s still whole. It’s wide at one end and long and slender at the other. Brown lightning-like lines run the length of its chalky, apricot-tinged body. It spirals around and opens up tantalizingly, leading the way to where an organism once lived. I had discovered a lightning whelk shell, the state shell of Texas. The shell, found along the Gulf Coast, is different from most other spiraling shells in that it coils in a counter-clockwise direction, opening up on the left side of the shell instead of the right. The shell houses a marine mollusk, though sometimes hermit crabs hitchhike rides in empty whelk shells. They are usually found at the bottom of bays near grass beds. Lightning whelk shells typically grow up to 8 inches, though some offshore specimens have grown as large as 16 inches. The lightning whelk eats bivalves (invertebrates with two shells) like oysters, clams and scallops. When feeding, an adult whelk will use the long edge of its shell as a crowbar to open up the bivalve. If that doesn’t work, the whelk will grind a hole in the bivalve’s shell to insert its toothed tongue. The lightning whelk “smells” its food with special sensory organs inside its body and will almost completely bury itself in sand, lying in wait for prey to approach. When it does move, it leaves behind a trail, making it easy for predators, including gulls, crabs and other whelks, to track. Texas has placed certain restrictions on collecting live lightning whelks at South Padre Island, where there is a daily limit of 15 univalve, or single-shelled, organisms, of which only two may be lightning whelks. Collecting any live or dead mollusks and their shells, including lightning whelks, is prohibited from Nov. 1 to April 30 along one part of the island. Permits are not required for collecting empty lightning whelk shells on the beach, though a Texas fishing license with a saltwater fishing stamp is required for harvesting any live marine animals that may be inside. The shell, named for the brown strips that radiate down its sides, has a long history in the Gulf area. Some Native Americans used the shell for religious rituals, believing the shell was sacred. They also made practical tools like scrapers, gouges, cups and bowls from it.